In 1983, I was living in New England and unemployed for the first time since I got married. I tried my hand at contract programming for a bit of time until I was hired as a programmer/analyst by a friend. The contract programming thing went bust for a pretty obvious reason (at least looking at it in hindsight): I might be a great programmer, but I am a lousy businessperson. I'm terrible at handling money, marketing my services, or even adequately pricing my services. During that time, however, I spent time in Miami working with a couple of pharmacies. I stayed with my parents and lived in my old bedroom for a month or so, and used the cheap (then) airline fares to visit back home in New England (or have Sandra come down to Miami to visit). During this time in Miami, I went to a restaurant chain and had my first taste of Buffalo chicken wings. I was intrigued by the description (spicy! ), and was hooked on the very first bite. Now, I've since read the history of these chicken wings and how they started at the Anchor Bar in Buffalo, NY, but at the time, I was truly intrigued. I went back to the restaurant again and again until it was time for me to go back to New England. In New England, other restaurants were starting to pick up on the spicy appetizer. I remember Pizzeria Uno in Quincy Market had a rather unspicy and "dry" version of the wings, which I didn't mind, but never once confused with the "real thing" that I had back in Miami. I remember a funny episode during a trip to Australia in the mid-1980s when somebody asked me about the "culture" of America. I was specifically asked what appetizers were popular back in the states. "Hmm. Chicken fingers and Buffalo wings come to mind," I answered. I was met with stunned silence for a moment. Apparently, they never heard of these wonderful things down under. Finally, my companion (named Robert), commented, "You yanks have an awful sense of anatomy." In the late 1980s and into the 1990s, I did a lot of traveling while doing contract work with the Department of Defense. We did a lot of trade shows throughout the south, and eventually found a chain of restaurants called Hooter's. Hooter's claim to fame (at least food-wise) was their chicken wings. These were as good, or even better, than that place in Miami where I first sampled them. I think it was in Phoenix that I tried the wings in a Hooter's, and I made sure to try all four varieties (mild, medium, hot, and Three Mile Island—the latter with jalepeno peppers added into the sauce). Another chain that had decent wings was Chili's (they still do, by the way—just make sure you get them with the bones in them). My family would eat nearly weekly at the local Chili's in Salem and get an order of wings, some (free!) chips and salsa, and an order of nachos. The standard technique to make the wings is to simply deep fry them, and then toss them in a bowl full of butter (or margarine) mixed with hot sauce (e.g., Tabasco). Simple, huh? I remember being able to buy "frozen hot wings" from some company that makes prepared foods (Tyson?). To make these, you simply spread the wings onto a cookie sheet, and it came with a small packet of hot sauce that you could spread onto the wings before they cook. These had a more "barbecued" flavor than the traditional wings, but everybody in my house loved them—they were a common meal a while back. I don't see these anymore, though. Other frozen wings that are preglazed haven't really interested me—I really liked controlling the amount of hot sauce myself, thank you! 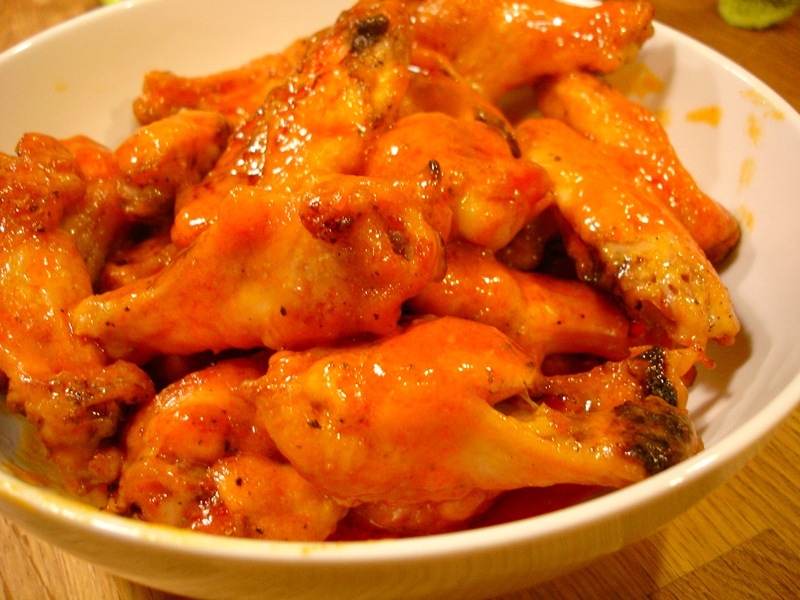 Nowadays, you can find Buffalo wings at a lot of places, and chances are that they will be pretty good. Unfortunately, Sandra doesn't eat them any more. She never really liked them, although she'd have one or two when I ordered them. Nowadays, she found out that a single chicken wing is worth three points on her Weight Watcher diet. She tells me that she'd rather spend her points (especially three of them!) on food that she really likes.